Harris Teeter announced today it will launch an Emergency Support campaign to benefit individuals and families affected by Hurricane Harvey. Throughout the month of September, the company invites their generous shoppers and valued associates to place a monetary donation in the donation boxes at its in-store Starbucks locations. 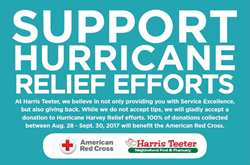 “The Red Cross is grateful for Harris Teeter’s contribution, which allows our organization to provide much-needed help to communities impacted by disasters like Hurricane Harvey to support people as they deal with the impact of a disaster and in the weeks following as they work to rebuild their lives,” said Elizabeth Penniman, vice president, Communications at the American Red Cross. For questions about Harris Teeter’s giving programs, please visit harristeeter.com.